Spring Festival continues here in China. It’s a photographers paradise with seemingly something to shoot around every corner. I had the pleasure of meeting one of my Flickr friends face to face today. Jeremy Breningstall is a Shanghai-based photojournalist. He and his wife Lisa are in Liuzhou for the week visiting relatives and, as you do, we went for a photo-walk. Sometimes you get lucky. 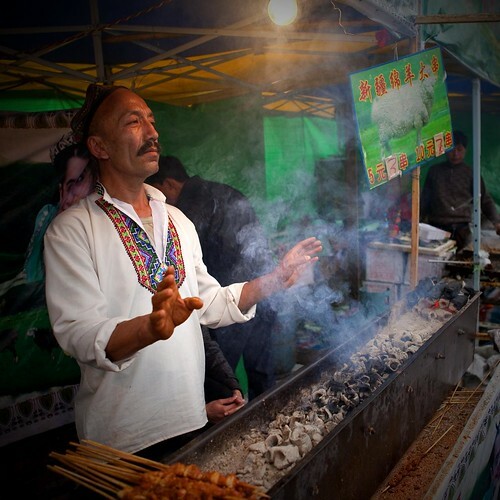 This Muslim vendor was selling lamb kebabs at a temporary stand he’d set up in Yu Feng Park. The way the smoke and the light came together was special, like he was on stage. We came across a large troupe performing a Lion Dance in another park by the river. I’m not sure who or what this guys function was but he was lovin’ the camera. After a little research I discovered that this is a laughing buddha. 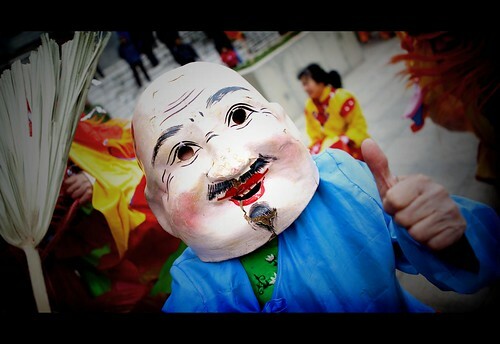 The Buddhas are comic and acrobatic characters who interact with the crowd and tease the lion with a fan. Once the paper mache head came off I could see it was a spry middle-aged woman! You can take a look at some of Jeremy’s work by visiting his blog here. If you make your way there I think you’ll enjoy the visit. I’m still recuperating from my marathon shoot so I’ll keep it short today. Thanks for all the supportive comments and for so many of you recommending the piece to others. I was truly humbled and appreciative that people would make the time. That project was a lot of fun and it seems like many folks enjoyed it. Until the next time… Peace! UPDATE: Featured February 17, 2010 at Planet Earth Daily Photo. ~ by Expatriate Games on February 17, 2010. Thanks Mark. Sometimes we get lucky… it’s one of my favorite shots. I have to tell you I don’t know exactly why either, but it moves me somehow. Love the kebab vendor! Great shot. Nice work. Now if only you could send some photographic goodness this way – rain and department stores don’t make for lots going on.